A MUST-READ FOR AINTREE AMATEUR JOCKEYS! 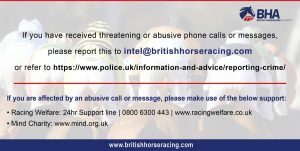 All amateur jockeys from both Ireland and the UK riding at Aintree over the next 3 days have been contacted with the following important information. This is a vital reminder for any jockey unsure of procedures. Course Walks: Following the 2-year trial of voluntary course walks at the Randox Health Grand National Festival, any rider who has not ridden over the Grand National fences more than twice at a Grand National Festival is required to take part in an official course walk with a BHA Jockey Coach. This will leave the Weighing Room at 10.30am on all 3 days of the Meeting, or at other times by arrangement with the Jockey Coaches. On Thursday the Jockey Coach will be Brian Harding, and on Friday and Saturday dual the Jockey Coach will be Grand National winning jockey Carl Llewellyn. Course walks will take place on ALL 3 days of the Meeting. The same initiative is also being made available to professional jockeys who are riding in the Topham and the Grand National. Those who are required to walk the course will have been notified by the BHA at declaration stage. Other jockeys are welcome to join them and walk the course. As last year, there will be a Pre-Race Briefing in the Stewards Room at 12 noon on Thursday for ALL amateur jockeys riding in the Foxhunter Steeple Chase, and on Saturday for ALL jockeys riding in the Grand National Steeple Chase. ALL JOCKEYS RIDING IN EITHER RACE MUST ATTEND. Jockeys are asked to approach the tapes no faster than a jig-jog. If the Starter is not satisfied, for any reason, with the manner in which the field approaches he will not start the race and will instead call the jockeys to a standing start. If you do not finish in the first 4, please unsaddle in the wash-down area, where there is an excellent team on hand to assist with washing down horses. For those fortunate enough to be interviewed by ITV Racing, we have requested that they speak to you before the post-race interview to confirm you are happy with the well-being of your horse. Please follow the instructions of the vets who may ask you to take additional turns on the horse or to dismount. If you feel the need, please dismount and move away from the horse and continue the interview on foot. The use of the whip at major race meetings is under the spotlight, particularly at the Grand National Festival and more recently at the Cheltenham Festival. We are grateful for your respect of the Rules whilst competing on the biggest stage – it is important to our sport. In recent years, jockeys have made excellent collective progress in relation to pulling-up tired and out of contention horses at the Grand National Festivals. We thank you for that and would once again urge you to do the same if you are out of contention. It is important from a welfare perspective. If a horse is caught after a fall or unseat, the jockey may ride the horse back to unsaddle only if s/he has been authorised to do so by a vet and the jockey has been assessed by a doctor or paramedic. If black/yellow direction markers are displayed anywhere in the fence/hurdle, the obstacle MUST be bypassed. Jockeys must follow the direction of the arrow on the direction markers. Thank you for your co-operation with the above to enable us to showcase the very best of our sport and we wish you and your horse good luck for a safe journey around Aintree. ARE YOU RIDING AT CHELTENHAM NEXT WEEK? IF SO, YOU NEED TO SIT DOWN AND READ THIS!!! As we approach The Cheltenham Festival, the BHA are writing with some important information and advice for all riders at this fixture. This includes changes linked to the recommendations of the BHA Cheltenham Festival Review, published in December 2018. The guidance for 2019, as detailed below, relates to: horse welfare, course walks and pre-race briefings, starting, whip use, pulling up of tired horses, remounting, disruption to racing and bypassing. The Cheltenham Festival Review included a recommendation that riders should be reminded of their responsibilities in relation to horse welfare. The welfare of horses is of paramount importance and riders should be aware that they will be subject to greater public scrutiny at these fixtures than is typically the case. The Stewards will be covering this subject at all pre-race briefings with riders. Any rider who has not ridden since 1 May 2017 on any/either Cheltenham course (Old/New) on which they are booked to ride is required to complete a mandatory course walk with a BHA Jockey Coach. This requirement is based on a recommendation made in The Cheltenham Festival Review. The only exceptions are riders who have ridden that course 25 times or more during their careers – these riders will be exempt and are not required to take the course walk unless they wish to do so. Once declarations are made, riders required to complete a course walk will be notified directly. In the meantime, if riders would like to know their experience status regarding a course walk, they can enquire via racing@britishhorseracing.com. 2 course walks will take place on each morning of The Festival. The first will take place at 10.15am, with the second at 11.15am. Any riders arriving at the course after these times, for rides later in the day, will have an additional course walk available to them once racing is underway and they should liaise with the BHA Jockey Coaches on the day to ensure they meet the requirements. In addition to these mandatory walks of the Old and New courses, any rider booked to ride the Cross Country course for the first time in their career will be required to walk the Cross Country course before the day of the race, or on the morning of Wednesday 13 March. Failure to complete a required course walk will result in disciplinary action from the stewards and possible suspension. The Cheltenham Festival Review also contained a recommendation relating to the daily briefing of riders during The Festival. It is a requirement that all riders attend these briefings, which will take place approximately 30 minutes prior to the start of the first race on each day in the Male Jockeys’ Changing Room. Riders will be required to sign in at scales to confirm their attendance. These briefings will cover the topics contained in this document and any additional operational or racing issues that may arise during the course of the Festival. As in previous years, there will be four Starters on duty at the Cheltenham Festival, three of whom will be available to help with girthing up and to provide other assistance at the start as needed. The current starting procedures are designed to reduce the speed at which riders approach the tapes and to give all horses the chance of a fair start. Outlined in the Appendix are the relevant BHA Rules and a summary of the procedures that will be in use at Cheltenham. Riders are asked to approach the tapes at no faster than a jig-jog. If the Starter is not satisfied, for any reason, with the manner in which the field approaches the Start on the first attempt, s/he will not start the race and will instead call the riders to a standing start. Any rider deemed to be in breach of the starting procedures (unless a problem arises through no fault of their own) will be reported to the Stewards. We appreciate that everyone is under pressure on these occasions but ask that jockeys please comply with the starting procedures. By working together, we can get races underway at the first time of asking. Penalties for misuse of the whip are suspensions and, in certain circumstances, fines. The Rules are designed to protect the welfare of horses and the image of horseracing. BHA guidelines on the use of the whip can be viewed via the link here (pages 22-25), along with a summary of the Rules/Penalties. These are also attached as an appendix to this document. As per the note on horse welfare above, use of the whip at these meetings will be under the spotlight. It is vital for the image of the sport that riders adhere to the guidelines. If any rider needs further guidance, they are advised to speak to the Chief Steward on duty. Increased emphasis on the pulling-up of horses that are out of contention was another recommendation of the Cheltenham Festival Review. Jockeys have made excellent collective progress in relation to pulling-up of tired and out of contention horses at both the Cheltenham and Grand National Festivals in recent years. We thank you for that and would once again urge you to do this if you are out of contention, as it is vital from both a welfare and a public perception perspective. The Rules provide the Stewards with wide powers in relation to this important equine welfare requirement. The penalties for breaching any welfare-related Rule are significant. If riders fall or are unseated during the race they may NOT remount their horse and continue in the race. If they do, the horse will be disqualified and the rider will be suspended. If a horse is caught after a fall or unseat, the jockey may ride the horse back to unsaddle ONLY if s/he has been authorised to do so by a vet and the jockey has been assessed by a Racecourse Medical Officer or ambulance paramedic as set out in the Rules (B 46.2 and B 46.3). A rider will be suspended if s/he rides back on a horse that has not been seen by a vet. At Cheltenham, all fences and hurdles are bypassable. If Black/Yellow direction markers are displayed anywhere in the fence/hurdle, the obstacle MUST be bypassed. Racecourses can now use more than the usual three direction markers in an obstacle if they wish. The rider must follow the direction of the arrow on the direction markers when bypassing an obstacle. In the event that drones are used, as part of an attempt to disrupt racing, contingency plans have been put in place. Please obey the instructions of officials. Please note that ITV will be using drones, by prior arrangement, but these will follow an agreed flight path at a safe distance from the track whilst races are in progress. Riders must not carry any form of advertising on any part of their raceday clothing or equipment, unless a Sponsorship Agreement has been lodged in advance with Weatherbys and approved by the BHA. Furthermore, the posterior site (beneath the coccyx site) is the property of the Professional Jockeys Association and, as such, may only be sold by them as part of a group deal. Thank you for your assistance with all of the above, which will help to ensure a successful and incident-free Cheltenham Festival, enabling us to showcase the very best of our sport. The BHA will assess these procedures following The Festival and will be in touch again in due course should changes be required for the Grand National Festival at Aintree. Unless unavoidable, races will not be started with horses coming directly from girthing pens to the start line. When girthing is complete, the Starter in charge shall mount the rostrum, even if there is still time to wait before the designated off time. When girthed up, horses will walk round on course some distance back from the Start. However, no start will be effected if the runners are too far back. It is envisaged that they will be approximately 25 – 30 yards maximum from the start line. There will be no goggles shout or any indication of the time remaining to the designated start time. It is the responsibility of the riders to be prepared, including having their goggles down, for the start. When the Starter, who will be at the top of the rostrum, wishes the field to walk forward he will raise his flag to indicate this and also give the normal voice instructions. The Advanced Flag Operator will simultaneously raise their flag which should also be visible to riders. Having raised the flag, only the Starter will issue instructions to the riders. The field must come forward at a walk and no faster than a jig jog. The start will be effected by the simultaneous release of the tape and dropping of the flag when the field have approached the Starter in such a way that he is satisfied that the start will be safe and fair. Races will not be started if the field line up and commence to move forward before the Starter raises his flag or approach the start at faster than a jig jog before the tape is released and flag lowered. If the above happens, the Starter will wave his flag to indicate that the race will not be started and the field must pull up. The Advance Flag Operator will also wave their flag to enable riders furthest away from the Starter to understand that the race will not be started. Should the field be unable to pull up, the tape may be released for safety reasons but the Starter will continue to wave his flag and declare a false start which will be reciprocated by the Advanced Flag Operator. If the race is not started at the first attempt, the field will regroup at the marker poles and a standing start to the satisfaction of the Starter will be effected by tape and flag. There will not be a further attempt at a walk-in start and runners will not be sent back further than is necessary to regroup at the marker poles. Starters will report offending riders to the Stewards. Walking round, Walking up and Turning back. 1.Rather than rules based solely on a fixed number, stewards will focus more on how the whip is used and be able to apply their discretion when considering a rider’s use of the whip. 2. The trigger for stewards to review a rider’s use of the whip remains the existing figures of eight times or more for Flat races and nine times or more for Jump races. However, rather than such use representing an automatic breach, the stewards will look at the ride and decide whether or not to hold an enquiry. d) Whether the horse was continuing to respond. 5. A rider found to have used his whip once over the permitted level, after the Stewards have applied their discretion, will be suspended for two days, two times over will incur a four day suspension and three times over a seven day suspension, with each extra usage adding two days to the penalty. 6. Previous offences are not to be taken into account when deciding on the level of penalty. Offences which incur a suspension of two to six days are to be treated separately from those offences that incur a suspension of seven days or more. 7. Under a revised referral process repeat offenders will be referred to the Disciplinary Panel and incur a lengthy suspension (see penalty guidelines). Riders will be referred after their fifth offence of a two to six day ban within the previous six months, or after their fourth offence of seven days or more within the previous six months. 8. It is generally accepted that the incentive to breach the rules is greater in more valuable races. Consequently stewards will have the ability to impose a fine on a rider between £200 and £10,000. This will apply in Jump races worth £20,000 or more and Flat races worth £27,500 or more. Stewards will consider the gravity of the offence and the rider’s earnings in that particular race when identifying the appropriate level of fine. 6. A safety vest is approved by the Authority if it meets (BS) EN 13158: 2009 or 2018. 8.2 attached to the horse or any equipment carried by the horse. The AJA are pleased to announce that, thanks to agreement reached with the BHA after very lengthy negotiation, as from 1st October 2010 there has been a change to the Rules of Racing whereby a conditional/apprentice jockey wishing to revert to amateur status can do so if s/he has not ridden more than 25 winners as a conditional/apprentice. In addition, the 48 month time limit within which a conditional/apprentice must revert has been scrapped. a Person is ineligible for an Amateur Rider’s Permit if he has been paid directly or indirectly for riding in a race, whether payment to him is made directly or indirectly. 19.2.2 the second condition is that he did not ride more than 25 winners under the Rules of any Recognised Racing Authority whilst holding such licences. 19.3.5 any other expenses or benefits approved by the Authority. As from 1 October no horse will be permitted to carry more than 4lbs overweight. Any Jockey that exceeds the 4lb threshold, by any amount, up to 15 minutes before the race will be replaced. The replacement Jockey will be of similar status i.e Claimer for Claimer. Late Jockey changes, through overweight, will not carry any penalties. Statistics show that in the main the new rule is more likely to affect Amateurs, Apprentices and Conditionals. 42.2.1 his body protector, and42.2.2 any blinkers, hood, visor, eyeshield, eyecover or number cloth which he is to carry in the race but which are excluded from the scale (by virtue of Paragraphs 42.4.6 to 42.4.10 and 42.4.17). 42.3.1 intends to carry over-weight, he must declare the amount, and42.3.2 is in doubt as to his proper weight, he may declare the weight he intends to carry. 42.4.1 skull cap,42.4.2 whip,42.4.3 bridle,42.4.4 rings,42.4.5 plates,42.4.6 blinkers,42.4.7 hood,42.4.8 visor,42.4.9 eyeshield,42.4.10 eyecover,42.4.11 anything worn on the horse’s legs,42.4.12 breast plate,42.4.13 breast girth,42.4.14 martingale,42.4.15 muzzle,42.4.16 neck strap,42.4.17 number cloth,42.4.18 sheepskin cheek pieces, and42.4.19 tongue strap. 42.5 Subject to Rule (F)143, no Rider may weigh out if he will be carrying 4lbs or more overweight. The claim of the rider must be ignored. e.g. Racecard weight 12st 2lbs even with a rider claiming 7lbs is still considered to be 12st 2lbs so cannot run. Scenarios are unlikely to occur Flat or Jumping. No rider may weigh out if he will be carrying 4lbs or more overweight (Rule (D)42.5). A rider or trainer cannot choose not to claim the riders allowance at scale (Rule (F)143.8). The claim must be taken into account when calculating the overweight e.g. Racecard weight 10st, rider claims 7lbs but is on the Scales at 9st 11lbs or more therefore cannot ride. A claiming rider must be replaced by any claiming rider regardless of licence e.g. on the Flat a 7lbs claiming Apprentice may be replaced by Gary Bartley who holds a full licence but claims 3lbs. A 3lbs claiming Amateur in an open professional race may be replaced by any claiming rider, Amateur or Professional/Conditional, regardless of how much the replacement claims (3 – 10lbs potentially). A claiming Conditional may be replaced by a claiming Amateur e.g. a 10lbs claimer riding for his own yard could be replaced by say Mr O Greenall claiming 3lbs. i.e. any claiming jockey must be replaced by any other jockey who claims an allowance irrespective of licence category, amateur or professional. A rider with no claim must be replaced by a rider with no claim e.g. L Dettori could be replaced by L Vickers, AP McCoy could potentially be replaced by an Amateur who does not claim. Riders in races confined to Conditionals, Apprentices or Amateurs can be replaced by any other qualified rider regardless of any allowance the rider might claim in the race e.g. in an Apprentice race a rider who has not ridden a winner and claims an allowance under the conditions of the race may be replaced by another qualified Apprentice who does not claim an allowance under the conditions of the race. There is NO distinction between Rhys Flint who holds a Conditional Licence and no longer claims and AP McCoy. A Rider who holds a Conditional Licence and no longer claims an allowance could replace AP McCoy. There is NO distinction between a non claiming Category B Amateur and AP McCoy. E.g. Mr Non Claiming Amateur would put up 4lbs or more in a valuable handicap chase and could be replaced by AP McCoy (and vice versa). In the same race the amateur Mr Bloggs claiming 7lbs could be replaced by top conditional P Toole, claiming 3lbs (and vice versa). Any rider may be replaced under the conditions of (B)25.3 e.g. hasn’t arrived in time, red entry etc by any available rider regardless of licence or claim.